This little Literacy Lab has its home high up in the belfry. Great Windmill Street at the heart of Soho may seem like a surprising place for a school. But sure enough there is one – the tiny Soho Parish Primary School is squeezed in among bars, boutiques and trendy PR agencies. The school has made clever use of space, as evidenced by the box-shaped adventure playground visible from the street. Inside, the rabbit warren-like corridors have been made navigable thanks to the addition of brightly coloured paint in differing shades (to the relief of our literacy tutors! ), resulting in what is quite possibly the pinkest school cloakroom in the country, maybe even the world! 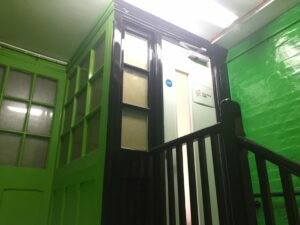 Our Literacy Lab is situated up in the belfry, at the top of a very tall, very green staircase. Formerly a cupboard, this Literacy Lab proves that we can fit in almost anywhere. From the outside, it looks a little like the Tardis… after a recent brush with kryptonite. Inside, it feels special and secretive, its lofty location allowing copious light to flood in. Inside, it’s small and very bright! There’s just enough space to comfortably fit a table and chairs for tutor and child. Phonic prompts decorate the walls and the display board features photos of the children who are part of the Literacy Lab alongside recent work. High frequency words in rocket shapes are pinned up by the door while a stack of coloured drawers is loaded with resources. It’s a homely, welcoming place. Our tutor Beata is keen for children to feel at home, choosing learning resources that appeal to the interests of current students and involving pupils in the making of prompt cards to support learning. As is the case at all of our Literacy Labs, we are keen to work closely with parents, inviting them in to observe sessions and take part in coffee mornings. Read all about the recent coffee morning we held for parents at Soho Parish Primary School. © 2019 The Children's Literacy Charity is a registered charity in England & Wales (1124257) and a registered company (6251103).